I recently received this question from a reader through the contact page of the site, and I love posting my responses to reader questions right here on the blog for everyone to see and learn from. I mean that is what we are all here for, right? One of the main points of the blog is to learn and grow from each other. If you have questions that you would like me to tackle, feel free to contact me either through the site or send an email. Can you postpone withdrawing money invested in a 401k retirement plan and wait until you move into a lower tax bracket simply by relying on savings for a year or two and then withdraw the money from a much lower tax bracket than the one I have been in for most of my life? Or, do I have to withdraw my 401k money at the highest tax rate I invested at? Do companies force you to withdraw upon retirement or can you pull your money out anytime you want? You must not withdraw the funds before you are 59 1/2 years-old or you will have to pay taxes and a penalty. There are a few exceptions to the rule, but for the most part, you will be hit with a 10% penalty if you withdraw any earnings from your 401k retirement plan before you reach the age of 59 ½. When you combine the penalty with your tax rate, you could see over half of your investment evaporate. Unlike a Roth IRA, 401k retirement plans have a mandatory withdraw clause where you must start taking money out of your account eventually. After the age of 70 ½ you are required to take out a minimum amount from your account every year. This minimum is recalculated every year based on your life expectancy and the amount of money in your account. Yes, you can you postpone withdrawing the money that you have invested in a 401k retirement plan and wait until you move into a lower tax bracket. If you have a large amount of savings or other investments, you may be able to find yourself in a smaller tax bracket by waiting before you withdraw your 401k money. It is perfectly fine to rely on personal savings or other outside money for a year or two and then withdraw funds from your 401k when you are in a lower tax bracket. The problem is that personal finance planning hopes to help you replace approximately 80% of your pre-retirement pay through investments. If you are successful in replacing your lost income, you may not find yourself in a lower tax bracket at all. In fact, I hope to continue increasing my income each year and throughout retirement which would land me in a higher tax bracket. That is why I love investing in Roth IRAs. The company you work for cannot force you to withdraw your 401k account upon retirement and they cannot tell you to withdraw the money out. It is your money, your account, in your own name. It is managed by a separate investment company that has no connection with your employer. Your employer will hire that investment company to manage the 401k plan on its behalf. 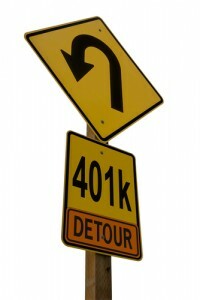 401k Retirement Plans are a great investment and retirement tool. Employees should definitely look into investing in their employer’s 401k plan especially if the companies offer employees some type of matching. The matching aspect is like earning a 100% rate of return on your investment. If anyone else has any questions about 401k retirement plans, Roth IRAs, or any personal finance questions, please feel free to email me directly at Hank [at] HankColeman.net. I found your article on google. I appreciate the refreshing points you make. Thanks for article i love this blog.but The standard withdrawal from a 401k retirement plan occurs when an individual has reached the age of 59 and a half or over. Once this milestone has been reached, the government will not impose an early withdrawal penalty of ten percent on whatever you take out. The 401k accounts are there to provide Americans with money when they retire, and the tax breaks that are involved are only available for those who use the account for retirement purposes. If money is withdrawn earlier, then there will be penalties.